Babysitting a Windows XP installation is no fun. Time consuming! And the installation is just the beginning of it. After it’s finished, you have to install drivers, tweak settings, and then proceed to install what feels like a million Windows updates which are usually accompanied by a couple of reboots. If you are like me and would prefer to have this process automated then you’ve come to the right place. I would like to show you how you can automate this whole process using a great little program called Windows XP nLite. Before we get started you will need a Windows XP installation CD as well as the product key. You will also need a blank CD where you will write your new installation files to. 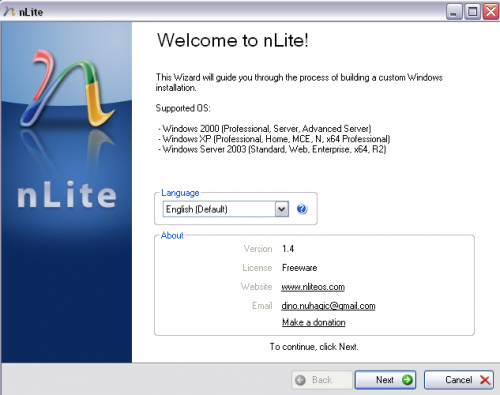 Download and install nLite. When you are finished run the program. Select your language in the welcome page as shown below, and click “Next”. You will now be asked to locate your Windows installation files. Click browse and choose your Windows XP installation CD. You will also be asked where you would like to save your Windows XP installation files. Create a new folder, name it whatever you like, and click “Ok”. nLite will now begin to copy the installation files from the CD to the folder you created. When it is finished, click “Next”. You will now be prompted with a Presets window. This is where you can choose your previous settings if you have already created an unattended installation CD before. Click “Next”. Now you will see the Task Selection window. This is where you will choose the operations you would like to perform. Click “All” and then “Next. 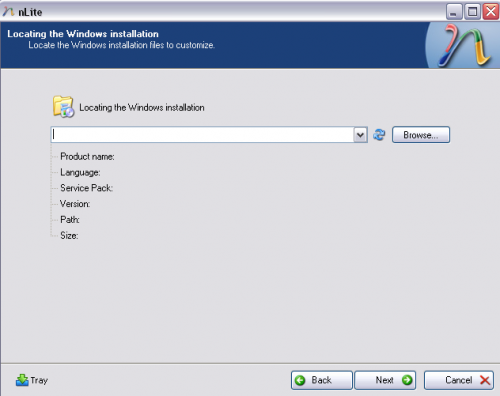 You will now be prompted for the location of the Windows Service Pack you would like to integrate into the installation. If your Windows XP Installation CD doesn’t include Service Pack 2 then download it here and select it. When you are finished, click “Next”. 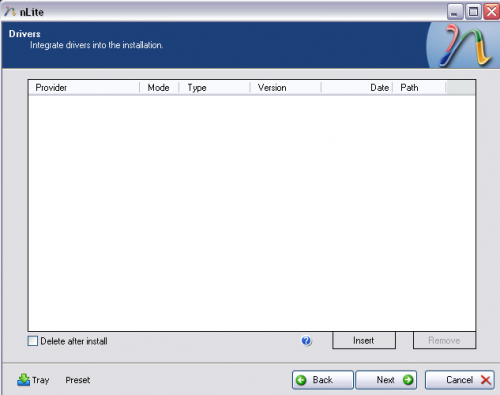 Here you can set your unattended installation CD to install the Windows updates during the installation process. In order to do this, you need to download all of the updates from Microsoft and save them to a folder. There is a great little program called Windows Updates Downloader that will help you with this. Once you download them, click “Insert” and select them all. Then click “Next”. Now you can select what specific drivers you want to preinstall with Windows besides the ones that are installed by default. If you don’t have any just click “Next”. Here you will be able to choose which Windows components not to install. When you are finished, click “Next”. 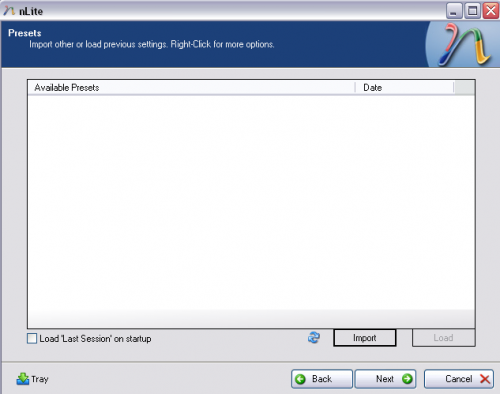 Now you will be able to set up the unattended part of the installation. If you have a product key, enter it here so you aren’t prompted for it during the installation. You can also tweak all of the other predefined settings. When you are finished, click “Next”. 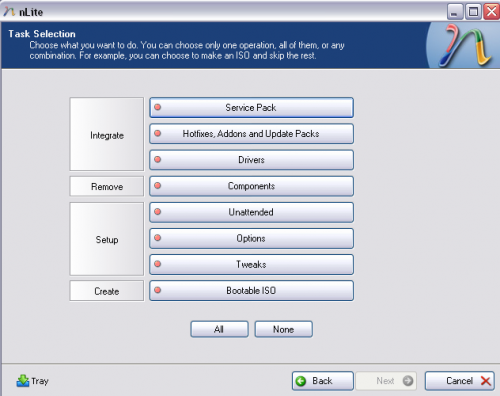 Here you will be able to change settings such as the language, install path or set up OEM branding. When you are finished, click “Next”. 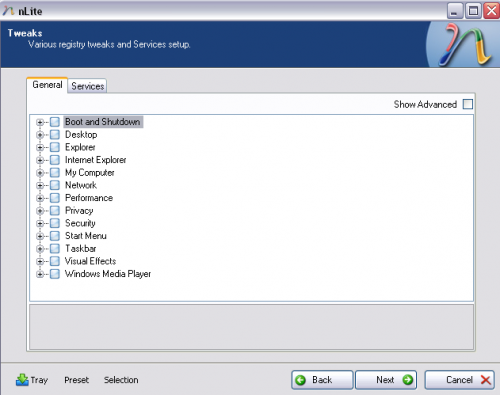 Here you can tweak various other Windows settings that you would normally set up after the installation finishes. Click “Next” when you are finished. You will now receive a prompt that says “Do You Want To Start The Process”. Click “Yes” and nLite will apply the patches and changes you made to your Windows installation folder. When the process has completed it will tell you how large your installation folder is. Click “Next”. Now you can create an ISO file for your new Windows XP unattended installation CD. You can also burn the the files directly to a CD without creating an ISO. And there you have it, your very own Windows XP unattended installation CD. If you have any experience with Windows XP nLite or any other programs used for creating unattended installation CDs, feel free to post. i followed your instructions but for some reason windows xp ask me for a product key during the unattended installation. the product key i used is genuine. i have searched online for a solution but no success, but i gotta tell you that everything else gets installed automatically except for the product key which i have to enter. just for the record, on step10 under unattended mode i chose “fully automated” what could be wrong? thanks in advance. please never mind my previous message, i finally got the unattended installation to work and the problem was that i was using a program that is used to install virtual machines which for some reason it kept asking for the product key, so today i used an actual computer to test the unattended cd and it worked. thank you. Thaks a lot for this great guide. Hey, this is great! I finish creating a image. I was wondering if you can add in some programs with this ISO image? Is it possible? Thanks in advance! Unfortunately, I am not aware of a way to do this in the current version of nLite. Yes you can add files to your ISO or CD/DVD. On the Bootable ISO page of nLite (last page) there is an information box with an “Explore” button. You can use this button to navigate to your files, or just copy them into your working folder before burning your ISO or disc. As far as I know, there is no way to do this with the currently installed OS. However, you can retrieve your Product Key using a program like WinKeyLite. http://www.emergingtechs.com/posts/how-find-and-change-windows-vista-xp-and-2003-product-key/ Hope this helps. Wow, its great ireally like it . OOOOh dear bundle of thanks thats what I was looking for….and today I found it…my good luck…but dear I have a question, Can I add applications, drivers for TV Card, Modem etc. please a quick answer will be highly appreciated. thanks once again!!!! If my unattended installation succeeds it will be very very helpful and nice. During unattended installation of XP, [partition of disk] portion is manual. Could it be unattended also? 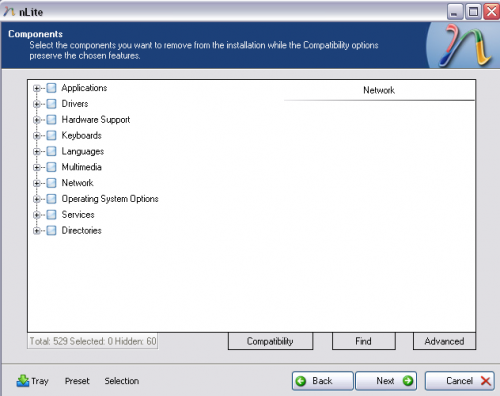 1: How to install drivers? 2: How to install softwares?? i have the setups but i cant install them bcous they are not for the silent installation, i just want the solution for that, is there any..! Also follow the below mentioned link to find out more. what if i need to use a different product key for each installation? can i leave it blank? can i enter key at the unique keys at the end of my installations? I want to do unattended installation of windows xp-2 from CD in a new unformated computer. I have done unattended installation from CD on running computer from support folder of windows xp. But I am not able to do unattended installation from CD in new system. Is there any way to do this? If yes, Please give me all the steps to be followed. Thanks a ton for such a good instruction to make unattended CD. Thanks a ton for such a good instruction about making unattended installation CD.